Egypt is a land of many mysteries, from the ancient civilizations, pyramids to pharaohs and stone tablets. It is a land that has attracted many scholars, philosophers, artists, poets, writers and with the sophisticated technology, many casino software developers have also joined the long list. WMS is a leading software company that has been inspired by Ancient Egyptian lifestyle to create another thrilling video slot branded Desert Cats. The developers drew their inspiration from the cat goodies called Bastet. You will see the cat goddess transform into different creature throughout the gameplay, including a lovely woman. Whenever you see that, be assured of lucrative payouts. Desert Cats video slot has a simple layout of seven reels on four rows and 50 possible ways to win. When combined with the special features, players have a chance of walking away with up to 2000 times the bet amount. Players are allowed to bet from a minimum of 50p per spin to a maximum of $100 per game. Also, the win lines are capped at 200 times the player's total stake which is unlocked by seven lions. If you have played WMS video slot, then you know what to expect from them; stunning graphics and visual animations, immersive soundtracks and effects, and a perfect game play on smartphones and tablets powered by Android and iOS. 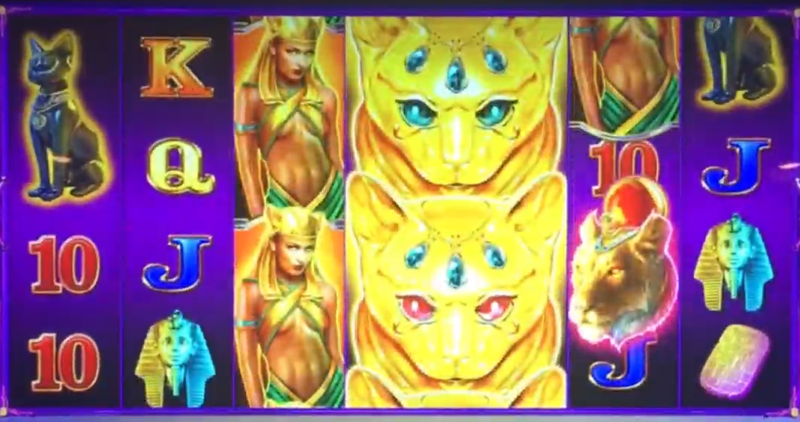 As aforementioned, Desert Cats joins the growing number of WMS's Egypt themed video slots alongside Lady of Egypt and Egyptian Riches. The game has a beautiful backdrop of the Great Pyramids at night. All the symbols used in the game are represented by common artifacts from the Ancient Civilisations such as Bastet, stone tablets, ankh crosses, lions and an Egyptian woman. The background soft drum music will soothe you as you aim for the highest prize. Although Desert Cats slot fits better in a brick and mortar casino, it is still enjoyable in online casinos too. The first thing that will strike your attention in Desert Cats video slot is the sleek interface on which sits a simple layout of 7 reels, four rows and 50 pay lines that pay from the leftmost to the rightmost reel. The symbols are pretty much what you expect from WMS and will increase your chances of winning. The two most important symbols to watch out are the transgender young Pharaoh and the Golden Cat Wild which can pay up to 4 times the bet. The betting range is pocket-friendly, from $0.50 up to a maximum of $100 time the bet amount. What's exciting about this game is that the wins are easy to get. Click on the +/- signs to increase or decrease your Total Bet. You will find other betting options, pay line information action, rules, and much more. Note that the Autoplay option allows you to set up to 200 spins to play uninterruptedly. Desert Cats video slot comes with some symbols and special features to boost your ways of winning. The symbols are divided into the low value which is represented by the traditional card symbols Q, A, J, K and 10. The high value symbols are marked by an Ankh, StoneTablet, and a Cat. Two highest paying symbols as mentioned above are the Golden Cat Head and the Cat. The wild symbol is the Golden Cat Head, and it will replace for all other symbols in a winning combination except the scatter symbol. Also, it can showcase as either a 1x1 symbol or 2x2 to boost your chances of possibly hitting the jackpot. The 2x2 Wild symbol features gems, but they are only active during the base game. The symbols without the gems will only appear during the Free Spins Bonus. The scatter symbol is represented by the Cat and landing three or more of the kind will trigger five free spins. Land four scatter to receive 15 free spins and a 10 x multiplier. More five scatter symbols will activate 50 free spins with a 15 times multiplier. 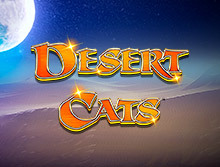 Desert Cats is a great slot game to play on the go or just from the comfort of your home. The will enjoy high end graphics and seamless gameplay on smartphones and tablets powered by Android and iOS. This slot game is offered instantly at bCasino, meaning, you dont have to worry about downloading any apps. WMS developers have employed new modern technology such as HTML5 which gives Desert Cats immersive gameplay. WMS Gaming software has been in the industry since 1943, creating tilt pinball games for land-based casinos before joining the online casino market in 2010. The developer has earned an excellent reputation for creating hypnotic slots with stunning graphics and great soundtracks. In addition, they feature multiple bonus features and different jackpots. Their slot games are playable across major devices including desktops, tablets, and smartphones. When it comes to choosing a casino to play Desert Cats video slots, there are several factors you need to consider. To cut a long story short, bCasino is the all-in-one casino site to try this slot either for free or real money. We are based in London and offer games including table and cards, video poker, live dealer, and many more from the best known developers in the gambling industry. All our games are individually tested for free and fair play before they are listed on the site. Also, we are licensed and regulated by the UK Gambling Commission and utilize the latest 128-bit Secure Socket Layer encryption software to protect the client's personal details and transactions. You will be lost for choice when you visit our payments section, as we support multiple widely accepted and safe deposit and withdrawal options. We value every opinion from our players; we offer live chats, email, and telephone as our primary modes of communication. Our highly experienced staff will provide you with the necessary information 24 hours 7 days.